Although the new book-flip view for managing cards is nice eye candy, I much preferred the older spreadsheet view which allowed me to make view many Q & As at the same time and make quick inline edits. Would you consider a toggle that allows a user to switch back and forth between the book mode and the older spreadsheet mode? If not, is it possible to get a copy of version 1 again? Over-all, I much preferred the minimal and unobtrusive interface and design of the old version. The new version feels flashy and gimmicky like Flash-My-Brain. The smooth glassy-black mode of version 1 was much nicer in my opinion. Please, please bring back the "spreadsheet view"... with the flipbook UI it's really hard to get an overview of what notes are where, since 75% of each note is covered by the adjacent one. And with more than about 50 notes in a stack it's incredibly awkward to flip through and edit. Is there any way to revert to V1.9 via the app store? I've already reported this as an issue. I had a courteous reply to the effect that the additional information now held made a table view less meaningful, but that they are working on different ways to show lots of information in one go. The need to get the program out of the door meant that these facilities couldn't be included in the first version, but that they were working hard to bring them in soon. Fair enough - I look forward to this and I'm happy to cut the developers slack while they do it. In the meantime, the lack of a table view is indeed a big step backwards in usability. I personally can't see what the 'cards' metaphor adds in the browse mode (as opposed to the screenshow mode, where it's essential) - it's the equivalent of Cover Flow in iTunes, a nice flashy idea but I hardly ever use it. The point is that in iTunes and the Finder, you can ignore it. At the moment, you can't in Mental Cards. I personally feel that the problems with a table view shouldn't be insuperable - iTunes also has a lot of information per record - but you can choose the columns you wish to see and accept that not everything (e.g. images) will be available in that view. At the moment we have a product which looks a bit nicer but it is a lot less usable in practice - but I'm sure they'll rectify this. I haven't upgraded yet, but I have to say that this would be a deal breaker for me. As a medical student I have TONS of cards, and I have to efficiently sort and select them while I'm reviewing. The table format is absolutely, unequivocally necessary for me to continue using this program. The problem with the App Store approach is that there isn't a trial version so you can assess whether the new version works for you. It's all or nothing. The new version does have many improvements in functionality as well as eye-candy, but if the absence of a spreadsheet view is a deal breaker, you can restore the old version from Time Machine easily. Simply delete the new version in Applications, and delete the preference files in ~/Library/Preferences. Don't delete the ~/Library/Applications Support/Mental Case folder - your old data is still there ready to be used again, but you may want to make a copy into a safe place first anyway. Finally, restore Mental Case.app from the Time Machine applications folder. Start it up and your old data will be there. You may have to reset some of the preferences, though. The App Store will recognise you have revered to the old version and will allow you to update to Version 2 once more when you're ready. I must emphasise that I'm certainly not encouraging anyone to do this - the new version is definitely an improvement in many ways. It's just that for the time being it's become less usable if you have a lot of cards and don't need the 'multiple facets to each card' facility, which I don't. I'm sure they'll fix this soon. Contact [email blocked] and we can arrange a copy of 1.9 for you. - You can test Mental Case 2 before upgrading in the App Store. Just go to http://www.mentalcaseapp.com/mac and download the free demo. It is functionally the same, and your 1.9 data will not be changed or removed. These features mean that a table view is not a good match. A table view has fixed columns, and so cannot easily adapt to varying numbers of facets in each note. A table view also does not handle formatted text. For these reasons we needed to move away from a table view approach to a grid approach. The new app is every bit as efficient as the original, particularly in editing mode, but it is different, and you may need to adapt a bit. That said, we are certainly planning new modes of browsing, including grid modes where you see all facets in a note at once, and possibly also a text-only table view that will not allow formatted text editing. We would have liked to have these in 2.0, but that's software development for you. Including them would have pushed the release out several months. Instead, we will add the features in minor upgrades. It would be great to have a table view. It's a very nice birds-eye-view of the case. Perhaps the table view could just ignore the font formatting which could be set in one of the other views. So, when you switch to the table view, all of the cards are displayed in a standard font with a set size of 12. I'd also like the dark screen glass-like presentation of version 1 as an option for viewing card shows. This might be impractical because of the new Q&A format. But, I'm an anti-clutter person. One of the main things that drew me towards Mental Case was the slick minimal interface. My favourite feature of version 1: disabling transitions. You can get a pretty similar experience to the old slideshows by just going into full screen mode. We're considering the table view option. Here's why this is important for me (and probably other users as well). I tried very hard to make use of the out-of-the-box lesson plans and scheduling when I first started using Mental Case 1.x. However, as a med student, I really need the flexibility to drill myself multiple times in one sitting on specific batches of cards. The batches are usually based on the level of progress I've achieved. This allows me to really focus my efforts on 'weak areas' that I know about, but which the software may not really catch. It also lets me do this incredibly efficiently. Let me give you an example, I have a test coming up in about a week. Each day I drill myself on the previous 3 days of cards several times. I use the columns to help me identify which cards have the least amount of study progress, and I really focus on these: I review them several times outside of the lesson (by multi-selecting them then choosing 'view selected cards), then I actually run the lesson. Then I move on to the next case, and repeat. As you can see, sorting and selecting from the grid is essential for this approach. Now, I know you're thinking, 'why not just use the lesson?' The answer is that I usually have to review at least 1500-2000 cards for each exam, so it's largely a question of efficiency. The lessons are great (when I have time), but the reality is that I don't always have the time to look at all the cards that the lesson wants me to look at. When I'm prepping for an exam, I need to focus my efforts based on overall progress trends, and these trends are extremely easy to identify using the grid view. If I use the lessons (which I do when I have time), I get stuck reviewing cards that I could probably skip, and I have less time to focus on the areas that are really weak. The great thing about the grid, is that I can identify and select these cards for review. As it is, I can live with the current version (honestly, I probably spend about 50+ hours a week using it), but I'd love to get in on the new features in 2.0. A grid mode and text-only table view would make us all happy I think ! When these are implemented please keep in mind a limitation of MC 1.9, we were stuck with a particular font size in the list view. When these come to 2.0, I hope this will be adjustable. 1) There is a 'Wrong' filter in the note browser. This will only show notes you got wrong when you last studied them. 2) There is a new 'cram' mode of study. This basically works like the Leitner system, showing notes you got wrong last time, and emphasizing those. It is ideal for exam cramming. 3) You can create smart stacks, and can make memory retention a criterion. You could make one for an exam, and have it show notes that you have got wrong twice in a row, or ones with a retention below a certain value. That sort of thing. I think we can improve on these things, but there is already quite a lot in there if you know where to look. Thanks, for the reply Drew. I still haven't had a chance to upgrade yet, so I appreciate the comments about the new features. I will definitely check out 2.0 and look into these features. I've got to add my vote for a spreadsheet view too. I am a medical student - and this view gave me a quick overview of all my cards. At the moment, it is very hard to find out what is exactly on which cards quickly. I can't see what value the deck of cards model adds - to be honest. Even with multiple facets (which I don't use) - it still takes many clicks to find out what is on a card. With a spreadsheet model - provided that the columns are user-definable, and there is horizontal scrolling available - it wouldn't matter if some of the fields were blank for some cards. It would still be quicker to look through a range of cards, and see what was on them, and to make changes to multiple cards (such as tagging). Please could you bring this back soon. Also, the inclusion of tags is really welcome - but a way of selecting multiple cards and tagging them quickly would make this much more useable. Again - this could be done very easily in a spreadsheet view. We will definitely be adding other viewing modes. The note browser does have advantages. It works better with n-facets. It is also more compact, presenting many more notes per screen than a table, which has lots of wasted space. But each approach has pros and cons, and other modes will be added. Agree with the above posters. We need the gird view for entering and viewing cards. If a user wants to format the text then they can use the current view. Right now I am forced to create my cards in excel, save as a csv, then import. Not ideal. Also, the flip view just isn't functional, it makes no sense to only see the front of one card. There could also be another drag and drop box next to each column where you could drop media/images. Tabbing between the boxes would be a required feature. I reiterate: we will be adding new modes in the future. I know that you've said more than once that there will be new models, and I do appreciate your responsiveness. It must be frustrating to have worked hard to get something out of the door and then be faced with comments, which inevitably will focus more on the negative than the positive aspects of the program (which are many). a) The concept of 'flipping' really doesn't work - it removes the ability to see the whole of the primary facet in one go, which can be crucial. It actually is less efficient than the physical model it's based on, because with real cards, I can at least take them out of the box and spread them on a table to see the whole of a facet at once. Yes, you've improved on the physical model because you've allowed us to click to see all the facets of an individual card (but not all at once for some reason): but the process (a to d above) to get to that feels intrusive and inefficient compared to the old method. You hint that much of the above has been done to save wasted space, but then include physical representations of the boxes themselves which add no useful information (apart from the title, which could be fitted in far more efficiently) and in many circumstances take up vast acres of screen space. I've included a screenshot illustrating some of the problems. Again, I apologise if this sounds negative, and if there are ways to accomplish anything I've said can't be done - I've looked through the manual several times. I really do like the program and wish it every success. - It shows many cards per screen, which is important for study cards, which tend to be sparse. This is optimal for quickly locating a card, because you can scan through many without scrolling. You are simply wrong about it being wasteful of screen real estate. To see this, simply count cards, and consider how much space would be wasted if you had table rows as wide as your screenshot. A quick estimate says there are at least twice as many notes on the screen in your screen shot as there would be in a table, and you have deliberately chosen a case where there is some wasted space in the browser view. - If you want to drill down to see a bit more detail, you can, using swiping and flipping. But this is not necessary in many cases. - You can more easily select and drag around notes, for reordering or moving to other cases. - You want to see all sides at once. We considered this less important, because the note browser is not the study or edit mode, it is purely for locating notes to organize them. The first facet will generally be good enough for this purpose. - You are working only with text, and want to be able to edit text in place. As I have already stated before, there are also pros and cons to every other browsing option. A table is particularly bad at representing formatted text, and altogether bad at representing non-tabular, variable-column data, such as multi-faceted notes. If you are only studying two sided notes, you may wonder what the problem is, but there are plenty of people who are going to be using the new option to go 3 facets or more, and even mix the number of facets in a single stack. We thought about every aspect of this decision a lot, and we decided the current browser was the best solution to begin with. But we are also well aware that other modes will work better for some users, and are going to add them. It was simply a question of not wanting to push the release date back any further, making everyone wait, just to get a few more features in. Thanks for the detailed reply, but I think you've misunderstand my point - I probably didn't explain it properly. It's not that the current view wastes space in comparison to a table view - I know that that will be a different beast given the need for you to represent additional facets. I'm not wrong about the waste of space, because there comes a point when enough cards are displayed on a screen to be perfectly acceptable. By my quick calculation, in my screen shot you've got 28 cards per row. Each card overlaps by about a quarter (possibly less?). So, present them face on and you get 21 cards per row. 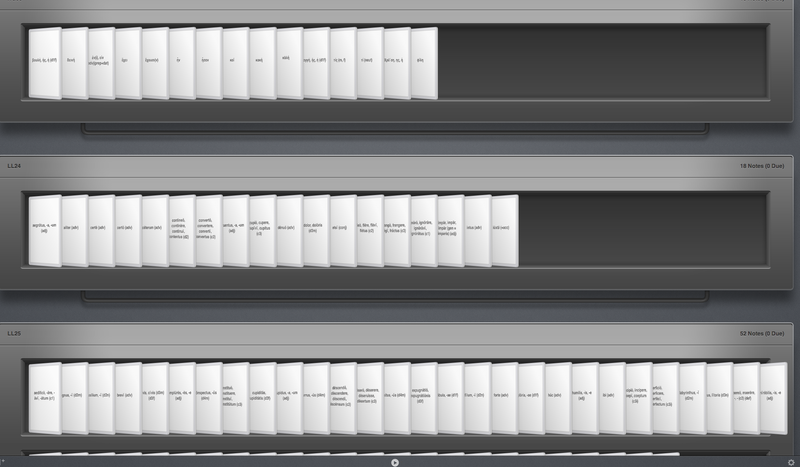 Take the best case scenario (no stacks, so no wasted space): I can get five rows on a screen, so with flipping I get 140 cards on the screen at once. If you presented each card face on, edge to edge, at the same size as currently, then assuming the overlap is about 1/4 (possibly less), you'd get 21 cards per row, or 105 cards per screen. (In comparison a table would probably give you 50-60 rows in view - respectable, but as you say, wasted space across the screen possibly.) The actual numbers will vary with screen size, but the basic proportions should stay broadly the same, I think. So, 140 cards, but I've got to flip through a lot of cards at once to be sure I've got the right one. It's just not true to say that for vocabulary work, for example, you can see enough on a flipped card to identify enough of them adequately. And they're not in alphabetical order, remember, and as soon as I've flipped I can't see the ones to the left, so I have to flip back to check…. Or 105 cards, where I can see everything on the primary facet and to see more cards all I've got to do is scroll down or press page down (which I'd have to do in most cases anyway even with flip mode). In practical terms the difference between the numbers of 'overlapped' and 'full face' isn't useful - too many cards on the screen can be just as distracting as too few, particularly when you can't sort for meaning anyway. That's why I would say that all the flip mode (not the card view) achieves is to impose additional actions on the user for little meaningful benefit. The compromise you've had to make between introducing flipping and the number on the screen, is in my view of course, not worth it. As for 'deliberately choosing' a screenshot with wasted space - the actual case has 20 stacks in. The program only shows me 3 stacks. But you say that organising is the whole point of this mode. So all that horizontal grey is preventing me seeing more stacks on the screen for the card to be filed in - that's why it's wasted. This is my problem with the mode as it stands - it's not the visual card depiction, per se, its the fact that the new visual metaphors of this mode (flip and picture of stack) seem to get in the way rather than help, even in the mode's own terms. Finally, I'd also point out again that the current view doesn't seem to allow formatted text, so it's not really an improvement over table view in that regard, either. Of course you must keep the basic concept of cards on the screen as an alternative to the table view, but I genuinely can't see that the flip model adds anything useful unless you're deliberately limiting yourself in the info you can see in unflipped mode - which for language work you can't really. So my submission would be: have the cards face on, remove the visual stack clutter, allow sorting and the selection of the facet to be chosen, and the concept can work in its own terms, without the need for the intrusive 'flip'. I know that you will take into account many points of view when you make your design decisions, but in the end it's obviously your choice to direct the development as you see fit. I've no problem with that and I'm not being argumentative for argument's sake. I've taken the trouble to try and explain my views in detail because I genuinely respect the program and I use it a lot and I hope that the feedback from such a user is useful. I fully understand your viewpoint, and have considered it throughout the dev process. That's why we are planing other modes. The existing mode will not be removed. I actually think many will prefer it. You underestimate how much space is wasted in a simple grid: flat notes are wider, they can't overlap and have to have reasonable margin to feel right. The existing view is just as good in that it is also just a more compact grid view. You don't have to flip the cards unless you want to. The trouble with some of your arguments is that you are comparing with a different alternative each time. The table is better at some things and worse at others. Same with a simple grid (eg it doesn't solve the one facet showing problem). We had to choose one view, and this was the one we decided to start with. Others are coming, so arguing about it is probably not getting us anywhere. Forgot to address the issue of formatted text, which maybe is useful. It's true we do not yet have formatted text displayed, but we may do that. The issue is really about editing the text. You can't edit text in the card browser. You go to the editing mode for that. The trouble with a table view is that people expect to be able to edit the text. So you can either block them from editing, and they will get mad, or you can allow it, and discard all formatting whenever they edit. I suspect many would be confused and angry if they lost their formatting whenever they edited text in the table. This is a serious count against a table view, and another reason we favored the card view for the first release. I can see the point about the formatted text - and I personally would happily accept the limitation of edit only in the browser cards. The default font is really a bit too small for comfortable reading with my eyes, though…. However, judging by your reply, I'm not sure I've got across properly what I was suggesting about the current browser mode. I'm certainly not comparing different alternatives each time: forget completely about the table or other simple grid modes - my suggestions relate purely to the current browse mode. And I don't see why you think suggesting changing the layout of the individual notes at all, so new considerations of "flat notes and margins" don't come into it. You've already solved those issues when you display the currently selected note (i.e. with the blue border). Display 20-ish of those across the screen instead of 28 [pro rata for screen size of course) and you've got all the current functionality (including access to multi-facets) at the cost of a small reduction in the available number of cards on one screen, which is more than made up for by the ability to see all the relevant primary facet title. You'd have to truncate some text - but you have to do that anyway. That's it: no more need to flip through several cards to see which one you want. I feel you're downplaying the frustration caused by the combination of not being able to see the left hand side of the card and the lack of ability to sort. But of course, as I said before, it's your responsibility to make the decision and I fully respect that and won't comment any more…. I'm not downplaying your suggestions. We will be introducing options that address your concerns in the not too distant future. Saying that the new format is "space conscious" is just silly. It is terrible. Actually look at the attached screen shot. How is only seeing one card at the beginning of each row efficient? You could probably fit 100,000 cards on the screen if they were only a single pixel in size, but that is just as useless. What does "not too distant future" mean in terms of days/weeks? I agree with radycardia. When will you be "upgrading" again so we can have the grid style back? I appreciate that your team is working hard to improve a useful product, but I feel that the majority of people who buy your product find the new interface to be a total step backward in utility. Scrolling up and down to see more cards is extremely easy. "Flipping" cards individually to see one at a time is useless. It is useless, as much as you don't think it is. I don't know how your argument about having a grid system is not efficient for more than two facets makes sense. If I write in an excel spreadsheet, say a drug, with different categories, and then am able to fill in the different categories for each drug, how does a grid system not fulfill that most efficiently? So what I can't see 100 cards. If I can see 20 cards easily, and then move my finger on the trackpad to scroll, I can see all cards in a stack quickly and efficiently, and I can see what I put on the cards. On all the facets, presumably. I would much rather do this than what you are suggesting the current system allows, which after reading all of your responses, still does not really make sense to me. YOU HAVE TO CLICK EACH CARD TO SEE THE FRONT. THEN YOU HAVE TO CLICK AGAIN TO SEE THE BACK. TO FIND A CARD, I HAVE TO CLICK THROUGH EACH CARD INDIVIDUALLY UNTIL I COME TO IT. HOW IS THIS EFFICIENT? I honestly cannot think of one positive about the new interface. Not one. I don't know what focus group you used to be convinced that this is a great setup, because I am quite positive nobody in medical school, dental school, pharmacy school, or language study will find this interface useful. The bottom line is this: You have pleased enough people with your old program, which was quite good, to care enough about your new product to not only be angry with it, but to find out your website and try to give you feedback. In all honesty, you are lucky to have this type of situation, because the alternative is to just have people quit using your product and buy the alternative. The only thing I want to know is: when can we expect the change? A month? Six months? A Year? Thanks. drewmccormack closed this discussion on 30 Nov, 2011 04:04 PM.